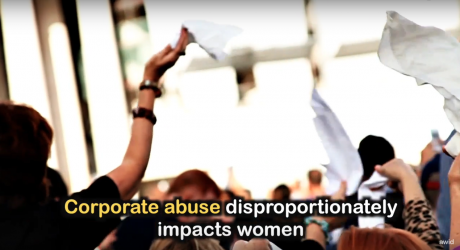 "Corporate abuse disproportionately impacts women" still from video.“There’s more money now in the world than ever before in history. We have that wealth, it’s about redistributing it,” says Sanam Amin from the Asia Pacific Forum on Women, Law, and Development. For too long we’ve been left with few options other than to rely on the ‘good will’ of giant companies, and have seen lands and waters destroyed, and resources plundered from local communities offered very little in return. Follow #Feminists4BindingTreaty for updates on the campaign.